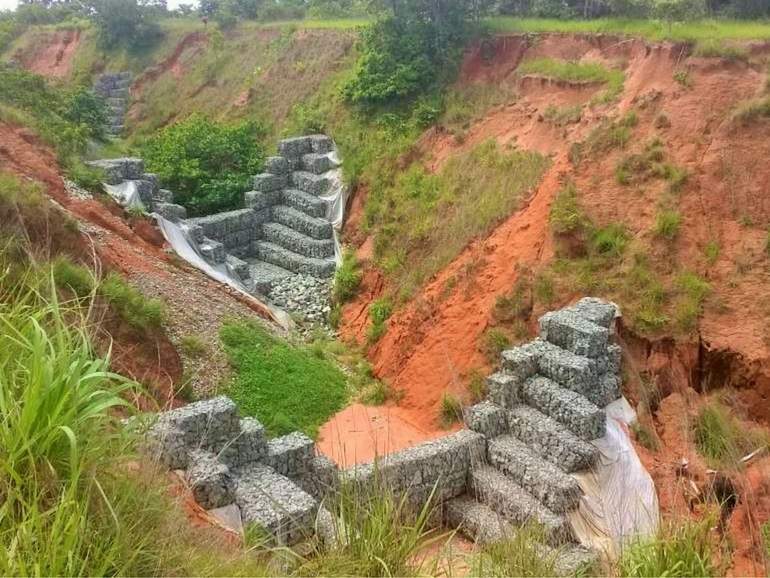 The Nigeria Erosion and Watershed Management Project (NEWMAP) intervened to stop further erosion of the gully in Nsude community as it was posing a serious threat to the lives and security of the inhabitants. Nest Engineering Limited, the local consultant involved in the project, proposed the construction of a series of check dams to reduce the energy of flood water, enabling successful revegetation and stability of the gully. The Nsude community is located in the Udi Local Government Area of the Enugu State. The area is crossed by a gully with two tributaries, which were expanding at an alarming rate, posing a serious threat to public utilities in the community. The first tributary was formed due to uncontrolled discharge from a twin tank reservoir supplying pipe-borne water to Enugu city. The second tributary was formed due to unchecked local drainage systems. With the gully spreading at an alarming rate, the NEWMAP intervened to curb the menace. Nest Engineering Limited proposed the construction of a series of check dams to reduce the energy of flood water and ultimately reduce surface run-off of the gully. These check dams were built using our gabions, Reno Mattresses and MacTex N geotextiles. Once completed with our flexible and eco-friendly products, the check dams have successfully stopped erosion and helped the growth of vegetation. The gully is now stable and the spread arrested. For more information, download our case history.